The post is devoted to the Wpf datagrid with cells that have defined fixed size but a number of rows and columns is updated dynamically in order to fill all available space. For example, such grid could be used in games at infinite 2D field or implementation of cellular automaton. In the previous article, Wpf data grid is considered such that it has dynamically defined a number of rows and columns but all cells have the same size. Solution uses C#6, .Net 4.6.1, Wpf with MVVM pattern, NuGet packages Unity and Ikc5.TypeLibrary. 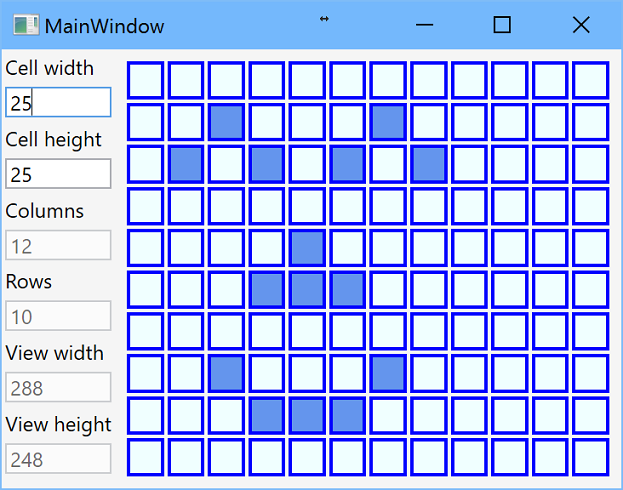 Wpf application is done in MVVM pattern with one main window. Dynamic grid is implemented as user control that contains DataGrid control bound to observable collection of collections of cell view models. As was mentioned above, code of this post is based on code from previous post, so here we focus on new or changed code. View model of dynamic data grid contains cell, view and grid sizes, data model for cell set, and collection of collections of cell view models. View size properties are bound to actual size of data grid control. Actually, it is not a clear approach from the point of MVVM pattern, as view model should know nothing about view, but it is realized in accurate way via binding and attached properties. Grid size, i.e. number of rows and columns, is calculated as view size divided by cell size. As number of rows and columns are integers, real size of cells on the view could not equal to values of cell width and height. After control size is changed and number of rows and columns of grid are calculated, cell set is recreated, but state of cells are preserved. Then collection of cell view models is updated by asynchronous method. Method analyses necessary changes and remove or add rows and remove or add cell view models to rows. Asynchronous method allows to keep application responsible, and using cancellation token allows to cancel updating if control size is changed again. /// width in OneWay binding. /// height in OneWay binding. /// Width of the cell. /// Height of the cell. /// Count of grid columns. /// Count of grid rows. /// 2-dimensional collections for CellViewModels. /// Start, the lightest, color of cells. /// Finish, the darkest, color of cells. /// Color of borders around cells. There is an issue with binding to view size - as bindings are executed in single thread, new values of view width and height come in different moments. It means that it is necessary wait for another one. In addition, in order to prevent too frequent changes of grid sizes if user are resizing window slowly, timer is used in application. The timer is created in constructor and starts or restarts each time one view height or view width are changed. /// Start timer when one of the view's dimensions is changed and wait for another. /// Method change data model and grid size due to change of view size. After new cells set is created, collection of cell view models should be updated. In the previous post, this collection was recreated each time and it leads to application hangs. This issue is solved by asynchronous method of updating current collection. Due to Wpf architecture and as dynamic grid user control item source is bound to Cells collection, all changes of this collection is done via Dispatcher. In the application priority DispatcherPriority.ApplicationIdle is used as it is executed after all data bindings, but other value could be used. Start point is the method CreateOrUpdateCellViewModels that creates Cells collection at first time, creates cancellation token and starts asynchronous recurrent method CreateCellViewModelsAsync for the first row. /// Add or remove cell view models to the row. /// rowNumber row in data model.